The Springboks under Rassie Erasmus seem to be turning the corner and starting to revive the glory of past years and much of it has to do with the form of his overseas players. Faf de Klerk, Willie le Roux and Francois Louw were all in fine form in yesterdays win over Argentina. The tiny scrum half, who rose to fame for the Lions in Super Rugby, fell out of favour with the Springboks before moving to Sale Sharks. His 2017/18 season was one to remember as he filled an interesting role at the club seeing him play a few games at 10 and kicking for poles. He played in all 22 of Sale's Premiership games scoring just shy of 100 poiints for the club. In yesterdays performance he underlined his importance with 3 try assists and an important try for himself as he kept Argentina honest around the ruck all game. He has ressurected his international career and has quickly become the 1st choice under Rassie Erasmus. Another player that has been in incredible form for the '95 and '07 World Cup winners and has become a first choice under the new coach. Le Roux left the Durban based Sharks side and took up a role with Wasps where he had a phenominal season to say the least. Over last seasons Premiership, the 29 year old beat 30 players, made 31 clean breaks and provided 21 try assists for his new club. 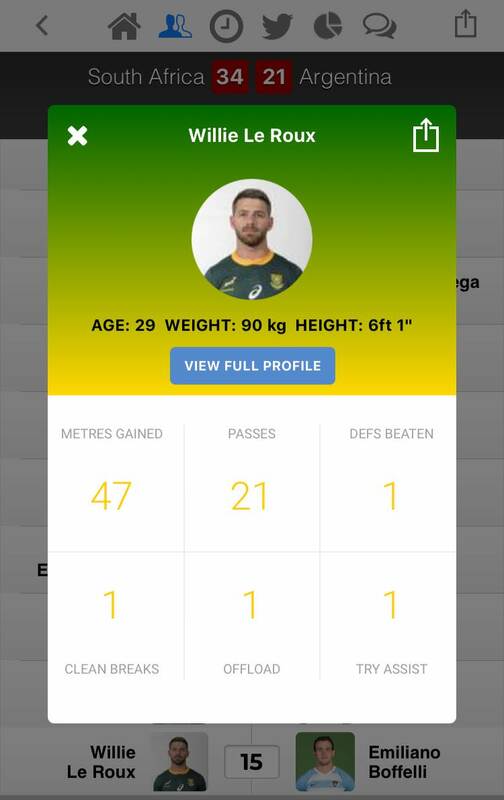 This form has travelled with him as he provides an ongoing threat to all defences and is a master under the high ball, a place where the Springboks have struggled of late. His kicking from hand in yesterdays win was an incredible attacking tool with the speed he had flanking him and executed all his defensive duties well. Louw has been at Bath Rugby since 2011 and last season completed 90% of his tackles in the 8 games he played in the Premiership. He was industrious around the park slowing down ball and effecting steals. His role in supporting the big ball carriers to secure good ball for de Klerk was noticeable as he and Kolisi provided a firm platform for their side.